I’m the type of person tries to only order out food I know I can’t make at home. That is why you typically can’t find me at a steakhouse, ordering a hamburger or a bowl of spaghetti (although I am lazy from time to time). Before I started this blog, I don’t think I would have had an itch to try to make something at home after I ate it out at a restaurant, but here I am attempting what is probably the impossible. I don’t expect to ever master the art of Vietnamese, Indian or Thai food at home but it is fun to try. 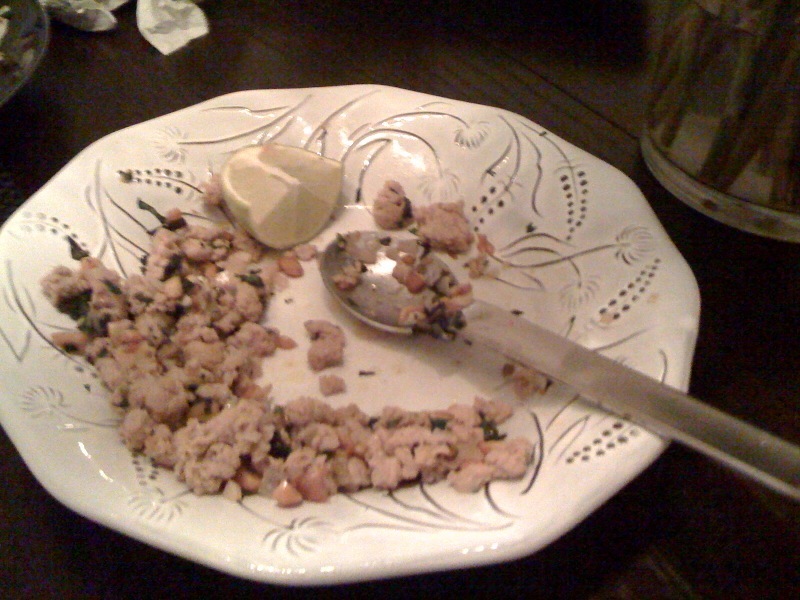 This year my friend Andrew turned me on to the Ground Chicken with Basil at Rearn Thai on West Market Street. We have convinced ourselves that is it healthy although I’m sure it has more sodium than we would like to imagine. Over Christmas I stole my neighbor’s Food and Wine magazine while I was feeding their cats and ran into a recipe for Thai Ground Pork Salad that looked very much like the Ground Chicken with Basil. I thought this would be a great start to experimenting with this recipe at home. I made the Food and Wine recipe using ground chicken instead of pork and served rice and spicy sesame snow peas on the side. Like I predicted, the meat needed more salt and didn’t taste exactly like I hoped. The next day for lunch, I combined the left over rice, snow peas and ground chicken, added a little soy and a lot of sriracha and loved the second go-round! Like all cooking experiments – or any experiment for that matter – we live and we learn (look at me trying to be philosophical about the scientific method). Below are the components. I recommend combining them and serving with soy and lots of sriracha! Assembly: In a bowl, combine the chicken, garlic, shallots and jalapeño. In a separate bowl, combine the lime juice, fish sauce, brown sugar and sriracha. In a skillet, heat the oil and add the meat mixture. Cook over medium high heat and break apart. Turn off the heat and add the other mixture and herbs. Taste for salt and pepper. Assembly: In a skillet, heat the two oils. Throw in the peas and cook for one minute. Then add a splash of soy or tamari and allow to steam until bright green! Yum! Oh Reahn Thai. We are definitely going to try this. I have “mastered” a pad thai-ish hodge-podge recipe as well as peanut noodles. This will be a good next endeavor. However, I am a total FAIL on anything Indian. Cooking with curry (completely separate from eating curry) is beyond my Midwestern sensibilities. For some reason I must have mistakenly thrown away the Cook’s Magazine. The only thing that I remember them talking about was that chopping your own chicken in the Cuisinart made it much better than using ground chicken. Might want to try that sometime. You can buy both boneless breast as well as boneless thighs.